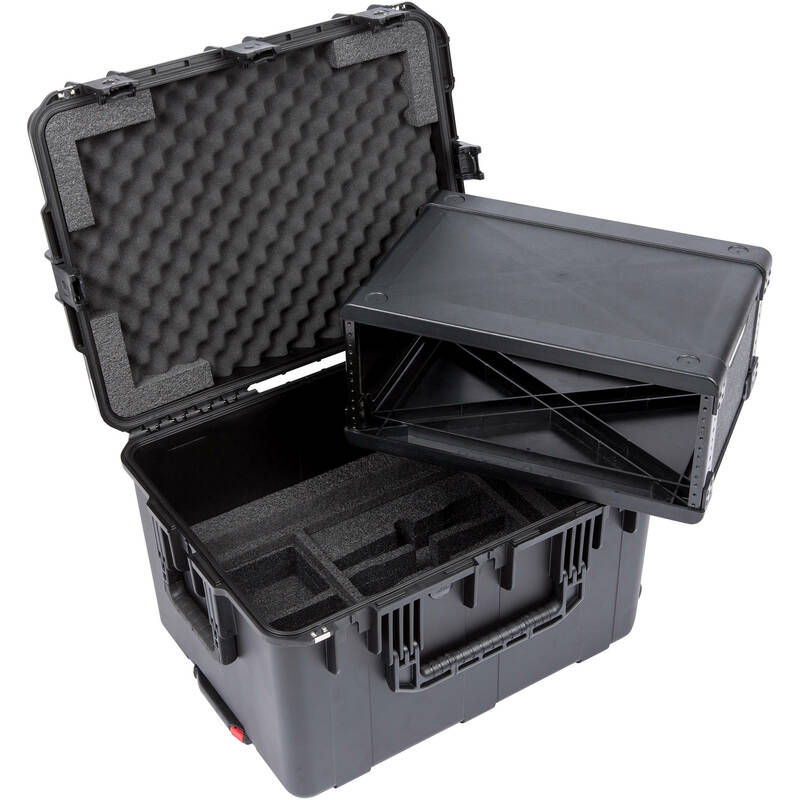 The 4U iSeries 2317-14 Wireless Microphone Fly Rack from SKB allows for transport of both rack equipment and wireless systems all in the same case. It features a 4 RU injection-molded rack frame with space below for four wireless handheld transmitters and four bodypack transmitters, with additional space for smaller accessories. In addition, there are built-in wheels and a pull handle for easy transport to and from locations. The SKB iSeries injection molded MIL-standard waterproof case is molded of ultra-high-strength polypropylene copolymer resin and is built with a gasket-sealed, watertight and dusttight, submersible design (MIL-C-4150J and IP67). Other features include: a molded-in hinge, trigger-release latch system, comfortable snap-down rubber over molded cushion grip handles, automatic ambient pressure equalization valve (MIL-STD-648C), and resistance to UV, solvents, corrosion, fungus, and impact damage (MIL-STD-810G). Box Dimensions (LxWxH) 26.75 x 15.75 x 15.25"